Create ringtones with your own customized Morse Code messages. Don't bore people with yet another pop tune blaring from your phone. Be different... retro-tech. Communicate. Or just hide really funny messages in your ringtones for "special" people (be they your best friends or your worse enemies). Only other Alpha-geeks will understand. You can email your new Morse Code ringtone file to yourself or a friend, and use iTunes on a Mac or PC to install the ringtone file to your iPhone. Using iTunes on a Mac, simply connect your iPhone, and drag-and-drop the new ringtone file to "On My Device". This app allows pasting your new Morse Code ringtone sound directly into an iOS GarageBand track, thus allowing one to create a ringtone directly on a iOS device, without having to Sync with iTunes. Using GarageBand on iOS to install a ringtone is not a simple one-step process. GarageBand requires a user to navigate and find several interesting looking and nearly hidden buttons in order to install a new ringtone. Once the new ringtone file is on your iPhone, you can use the Settings app in order to select your new custom ringtone. 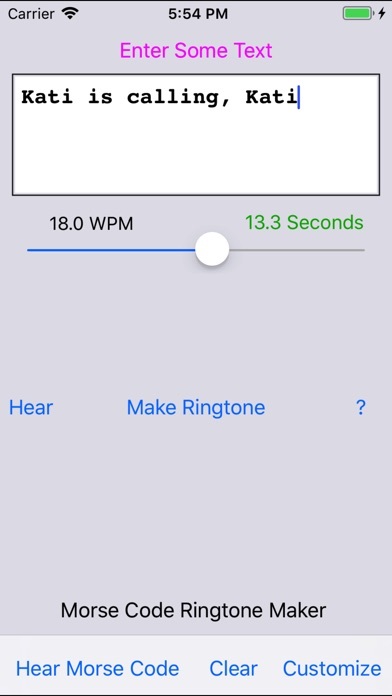 With Morse Code Ringtone Maker, you can customize the text and the Morse Code/CW speed (combined up to 30 seconds), as well as the the tone frequency. The Words-Per-Minute (WPM) speed is variable from 5 to 40 WPM. The tone frequency is customizable from 300 to 1200 Hz. On the customization page, you can additionally configure Farnsworth timing where the dots and dashes for each letter come even faster than the WPM of the letters. For different timbres, select Sinewaves, Square-waves or Triangle-waves for your tone sound.